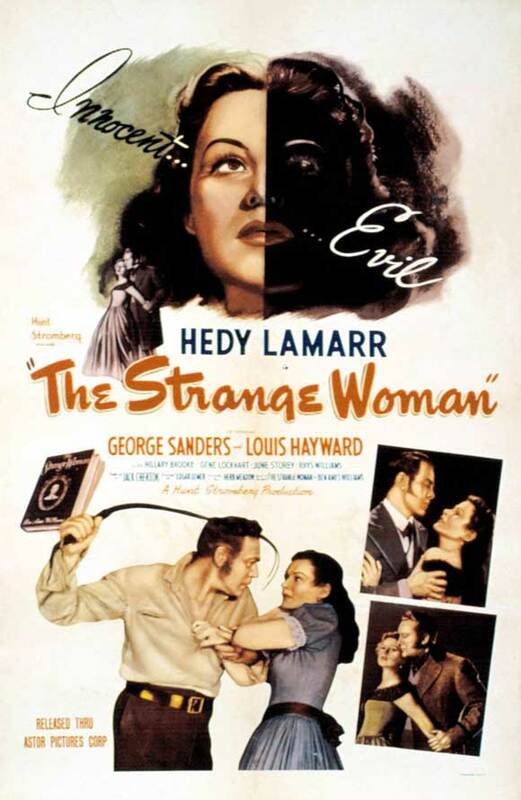 Edgar G. Ulmer’s The Strange Woman, directed with uncredited assistance from Douglas Sirk, is based on the 1945 novel of the same name by Ben Ames Williams. Born in 1889, Williams was a prolific novelist who is probably best known today for the same reason he was famous in 1946; he wrote the novel Leave Her to Heaven in 1944, which was made into a hit film in 1945 starring Gene Tierney as Ellen Berent, a calculating sociopath with twisted ideas about love. The Strange Woman was a natural choice to be made into a film following the success of Leave Her to Heaven. Both stories are psychosexual portraits of women with Electra complexes who use their allure to ensnare men and who don’t allow conventional morality to keep them from their goals; even taboos like murder mean nothing to them. Unlike Leave Her to Heaven, The Strange Woman is a period piece. The film begins in Bangor, Maine, in 1824. Young Jenny Hager (Jo Ann Marlowe) is being raised by a single father (Dennis Hoey) whose only love in life seems to be drink. After Mr. Hager receives stern words from prosperous shop keeper and importer Isaiah Poster (Gene Lockhart) when he once again begs a jug of liquor off of him, the scene switches to a river bank, where young Jenny is tormenting Mr. Poster’s son Ephraim (Christopher Severn), a sickly boy who can’t swim. She pushes him into the river and holds his head under with her bare foot, but when Judge Henry Saladine (Alan Napier) arrives in a carriage, she says, “Poor, poor Ephraim,” and jumps in. She drags him to shore and blames his predicament on the boys she was with. The judge is disgusted with Mr. Hager for stumbling through life drunk and failing to care for his daughter, but once Jenny and her father are alone, it’s clear that she loves him unconditionally. “Before long we’ll have everything,” she says. “Just as soon as I grow up we’ll have everything we want, because I’m going to be beautiful.” Mr. Hager tosses his empty jug into the river, and when the ripples clear, child actress Marlowe’s reflection has become that of the beautiful Hedy Lamarr. Jenny may be all grown up, but clearly only a few years have passed. All the adults are played by the same actors, and things are much the same in Bangor. Her father is still a hopeless drunk and Mr. Poster is still the wealthiest, most powerful man in town. Bangor appears to be a little rowdier, however, with more commerce coming through the docks, and more drunken sailors stumbling around. Jenny and her friend Lena (June Storey) hang around the waterfront, attracting the attention of sailors. Lena tells Jenny that, with her looks, she could get the youngest and best-looking men around, but Jenny replies that she’s only interested in snagging the richest. When her father confronts her, she flaunts her sexuality, bragging that she can make any man want her, and he beats her viciously. The whipping he gives her, while they stand face to face, is a little ambiguous, and more than a little sexual. She runs away to Mr. Poster’s house, and shows him the stripes on her back, throwing her hair forward and dropping the back of her dress, as if she’s posing for a racy portrait, and his face registers both shock and lust. Ephraim (now played by Louis Hayward) returns home, and he and Jenny slowly but surely fall for each other. As the film poster above rather obviously shows, Jenny has two faces. For instance, when she and Ephraim sit on the banks of the river together, her recollection of pushing him into the river when he was a boy is flawed. She tells him that those rotten boys did it to him, and she tried to save him. Is she lying? Does she know she is lying? Does he know? Does he go along with it because he loves her, or does he truly believe her? Jenny’s dual nature mirrors the nature of Bangor itself. On the one hand it is a prosperous New England town with an active churchgoing population of well-to-do people (like Mr. Poster and his young wife), but on the other hand it is a seedy little port city full of drunken sailors and “grog shops and low houses” (a.k.a. pubs and brothels). Jenny uses her husband’s money from his shipping and lumber businesses to improve the town, shaming him publicly into contributing large sums to the church. In private, however, she is carrying on with Ephraim, and even encourages him to arrange an “accident” for his father so they can be married. Ephraim won’t be the last man in Jenny’s trail of conquest, either. As soon as she lays her eyes on John Evered (George Sanders), the tall, strapping foreman of Mr. Poster’s lumber business, it’s clear that the weak-willed Ephraim doesn’t stand a chance. The Strange Woman is a well-made film with fine performances all around (with perhaps the exception of Gene Lockhart, who as Mr. Poster exhibits some of the most over-the-top reaction shots I’ve seen since watching Grayson Hall on Dark Shadows). Its narrative is sprawling, and clearly adapted from a novel, but the filmmakers keep everything moving along nicely. Director Ulmer was a talented craftsman who toiled away in Poverty Row for most of his career, producing a few masterpieces, a few awful pictures, and plenty of films in between. The Strange Woman represents the rare film on his résumé with a decent budget and a reasonable shooting schedule. He was lent out by P.R.C. (Producer’s Releasing Corporation) at Lamarr’s insistence (apparently they were friends back in their native Austria-Hungary). He was paid $250 a week for the job. P.R.C. studio boss Leon Fromkess, on the other hand, received roughly $2,500 from United Artists. While he may have gotten the short end of the stick financially, the deal gave Ulmer a chance to work with a professional cinematographer (Lucien Andriot), a major star or two, a well-written script based on a hot property, and major studio distribution. Posted in 1946, October 1946 and tagged Alan Napier, Ben Ames Williams, Carmen Dragon, Chief Yowlachie, Christopher Severn, Dennis Hoey, Douglas Sirk, Drama, Edgar G. Ulmer, Edith Evanson, Edward Biby, Eugen Schüfftan, Francis Pierlot, Gene Lockhart, George Sanders, Hedy Lamarr, Herb Meadow, Hillary Brooke, Hunt Stromberg, Ian Keith, Jack Chertok, James E. Newcom, Jessie Arnold, Jo Ann Marlowe, John M. Foley, June Storey, Katherine Yorke, Kathleen Lockhart, Louis Hayward, Lucien Andriot, Moroni Olsen, Olive Blakeney, Ray Teal, Rhys Williams, Richard G. Wray, Shirley Ulmer, The Strange Woman, United Artists. Bookmark the permalink.